A freak accident has left young Frank Eastman a paraplegic—a "wild card" who needs to "pair up with someone or something or he won't pass back into existence." Los Angeles, the scene of his accident, is where he imagines this existence to be. He settles into a rundown motel near Disneyland, his neighbors a wild assortment of eccentrics who, though more able-bodied than Frank, have learned the effectiveness of willful inability. What Frank learns from them, in magnificently odd and mesmerizing conversations, will leave him as transformed emotionally as he has been physically with a narrative at once ironic, hilarious, and poignant. 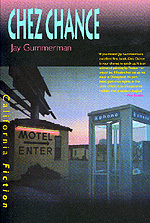 Jay Gummerman is the author of the short story collection We Find Ourselves in Moontown (1990). He lives in San Clemente, California.